Local government has long been treated as an unfashionable relation, neglected by Westminster yet still expected to deliver more on an ever-dwindling budget, as Parliament seeks to off-load both cuts and services. In reality, this unrelenting focus on finding savings places local Revenues and Benefits teams, and the data sets they produce, at the heart of decision making. Smart use of existing datasets and predictive modelling (possible even at household level) means the cumulative impact of reforms on each individual household (who will be impacted and by how much) is understood. This data can support the design of targeted, preventative support, delivering improved outcomes differently. 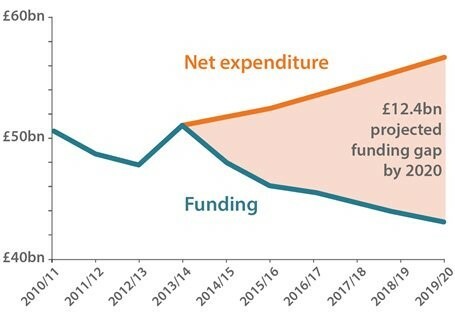 Local government in the UK is preparing for a 40 per cent cut in real terms funding over the next five years, having already made substantial savings in the last parliament. Over two-thirds of local authorities say that they won’t be able to meet this challenge through efficiencies alone. Figure 1 illustrates the LGA projections for income against expenditure for local authorities in England, as published in the Policy Exchange report Small Pieces, Loosely Joined. More than simple administrative efficiencies are required.to meet this challenge. Senior leaders need to harness the high quality, reliable, household data at their disposal to re-envision service delivery that reduces demand by changing lives. Local authorities have access to some of the most detailed information available on income, employment and poverty. This data comes from the UK’s complex welfare system. Data, primarily from housing benefit records, has always been available, but local authorities are only now beginning to unlock its full potential. Local and national services need to deliver effective support that transforms lives. They need to support people who are able toward independence, while protecting others from the impact of lower spending on services. To outsiders, the highly technical world of welfare and benefits processing hides a secret world of laser sharp information. In order to administer Housing Benefit and Council Tax Support, UK local governments hold detailed datasets on income, employment and poverty for all low income households in their area, typically around one-third of the total population. This is the data on which £25bn of housing benefit is paid, so it can be relied upon to be accurate, and up to date. The datasets have historically been used to report on benefits processing, and provide important statistics on the impact of welfare policies. Typically, this information has been retrospective, and the impact of each policy has been assessed in isolation. More recently, a revolution in predictive analytics is enabling local authorities to accurately model the cumulative impact of current and future reforms. Some councils are now learning how to unlock their own data to understand exactly how each households will be impacted. Household benefits in the UK are now capped at £26,000 per annum. This will drop to £20,000 per annum (£23,000 in London) from Autumn 2016. Smart analysis of existing datasets allows local authorities to proactively mitigate the impact of these cuts by understanding which households will be affected and ensuring appropriate support is in place. This can help to minimise both the social and financial impacts for both the household and the local authority. For example, this approach has enabled one local authority to support three times as many households into work, by communicating the impact early, in an engaging way, while providing effective employment support. There is palpable frustration in many local authorities as they seek information to help them plan, and wait for central government to give it to them. Past experience suggests they can be in for a long wait, and even then, the information may not necessarily give them everything they need. National priorities do not always match local needs. Using their own datasets in an intelligent way, allows local authorities to plan with certainty. Birmingham, Hounslow, Leeds and other councils have used their own data to model the impact of the National Living Wage, a higher personal allowance and welfare reforms such as Universal Credit and the Benefit Cap all the way through to 2020. Local authorities are still only scratching the surface. Much more could be done to understand the cumulative and future impact of changes in policy. The ‘leading lights’ councils we work with use our analysis to underpin difficult decisions. At a strategic level, they’re designing better council tax support schemes, balancing financial and policy priorities, and commissioning support based on the analysis of future impacts. At an operational level, they’re pinpointing which individual households are at risk of falling further into arrears. They know who will be better off under Universal Credit, or worse off under the Benefit Cap and, where appropriate, are supporting these people into work. This ‘snapshot’ analysis is also being turned into a live data feed that reports via an always up-to-date dashboard. The dashboard shows information on how households are impacted now and in the future and, crucially, can be used by the local authority to target support. This approach can enable local authorities to track the impact of their interventions over time. It can even inform the creation of randomised controlled trials (RCTs), where interventions are randomly allocated to similar households, and evaluated to see which approach proves more effective. The ambitious authorities we’re working with are also beginning to combine the insights from their dashboard with other datasets. For example, linking the impact of welfare reforms with data on support payments to help target interventions effectively, and help more people to sustain tenancies. Some councils have combined this with their data on troubled families, social care and social fund services, to see which households currently receive the most support. Typically unfashionable benefit processing teams hold these detailed datasets on income, employment and poverty. In a small number of leading councils across the UK, they are becoming the powerhouse behind a shift towards data-led, citizen-centred services that enable their council to do more with less. This progress will accelerate as more councils engage in this process, work together and share knowledge. Local authority data analysis is moving beyond information capture to be the centrepiece of bold delivery design. We hosted a webinar titled Revolutionising Government’s Relationship with Data recently. You can view the full recording here or view the slides (no audio) here. As demonstrated in the webinar, we provide a rich household level data set (in editable MS Excel) to clients with filters for each welfare reform, and showing the amount each household is impacted by. View the short, under-the-hood clip of a dataset demo below.